This image and information has been provided by Doug McKee. Doug writes "The Densitometer is for measuring the densities of negatives and came in both mains or battery powered versions. This one is for batteries and it took a No. 800 dry cell". 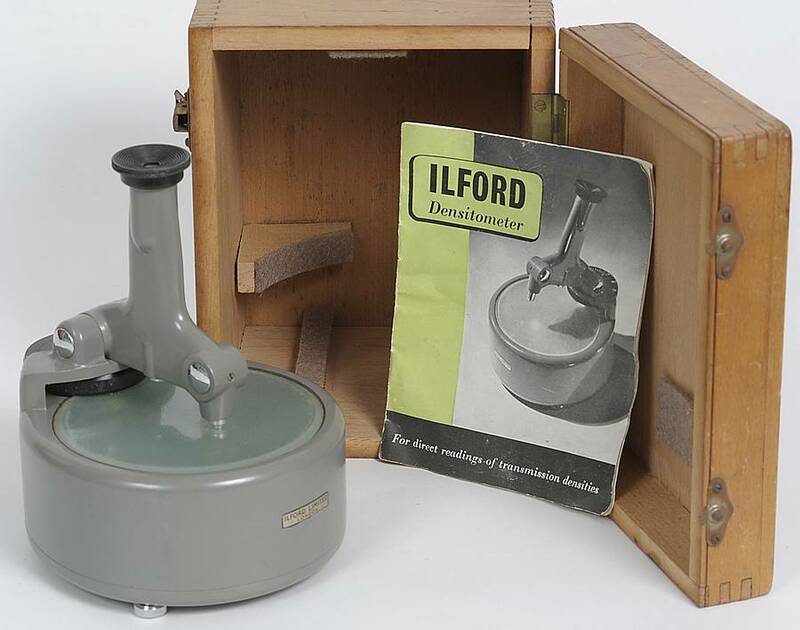 The Ilford Densitometer was reviewed in the British Journal Photographic Almanac (BJPA) for 1948 which means it existed in 1947. The instructions are dated 1951 and it appears in a trade catalogue for 1952, but not 1956. Previous owners could have been ignorant/careless and (within the Instruction booklet, download it below) paragraph 1 of the section entitled 'Adjustments' explains why item 6, the rod that operates the switch, may be missing!